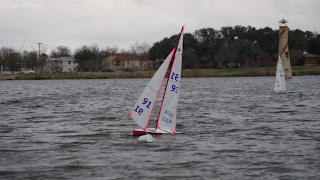 I have a new A set of sails and working on building a new set of B sails too. 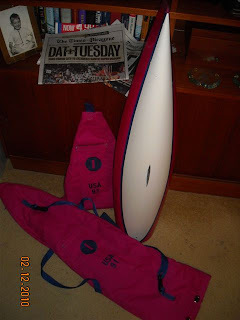 My original set A sails were really bad! Baggy, too full and just ugly. 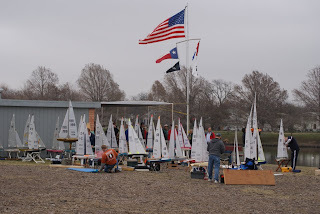 The Pirates of Woodlawn hosted the IOM Alamo Classic Regatta this past weekend and I made the 8 hour drive together with Hew to sail in this one day event. I am glad that I did, as it was a fantastic time! 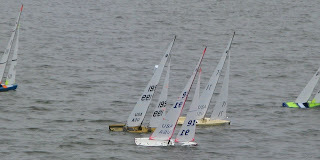 The atmosphere was very relaxed but yet the sailing was very competitive. 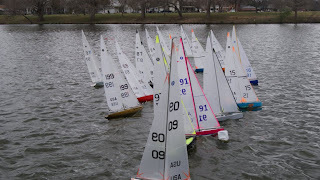 Historically the club has made this regatta a fun regatta, with the fleet split into 2 fleets, a gold fleet for the more experienced skippers and a silver fleet for the less experienced. 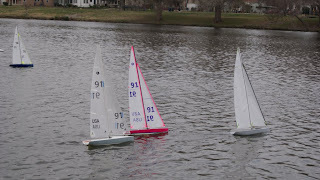 Both fleets shared the same start and course and the RD and his assistant had the fun in separating out the finishes to reflect each fleet. 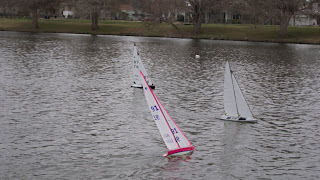 I sailed ‘OK’ in this regatta, making every one of the 17 starts and finishing every race, which says a lot for the quality of the build of my VEKTOR. The boat remained dry, with no leaks until the wind picked up and then I think the tape on the bow sections may have leaked a small amount. 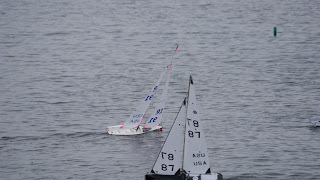 I am glad that Hew and I were able to fix the leak in my mast tube before the regatta. 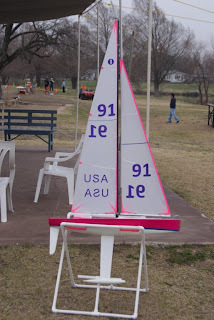 I am also thankful that he was able to mend my mainsail as it looked much better than it did last week. The final results showed me in 7th place in the Silver Fleet after 17 races, this was a fleet of 10 boats, so I did not do too well, but considering the number of times I sailed the IOM I am satisfied with this result. I have lots of room for improvement. 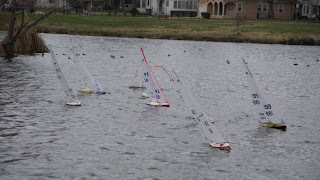 Hew sailed well and ended up the winner of the Gold Fleet. I guess the VEKTOR hull design is not a bad one; but I honestly think that the hull design is not as critical as the skill of the driver in tuning the boat and sails, getting a good start and sailing well – at least at my level of competence. 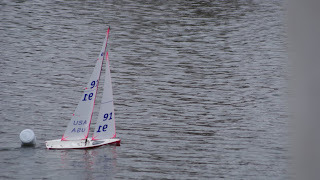 I am looking forward to racing this boat and to improving my position in the fleet. 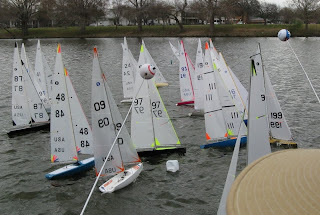 A typical crowded start, with 20 boats what else would you expect? 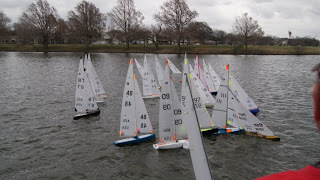 I am leaving today for San Antonio, TX to sail in my 1st IOM regatta! 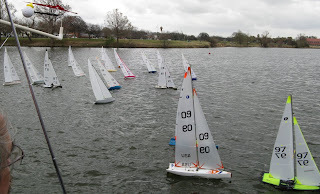 The Pirates of Woodlawn are hosting their famous ALAMO CLASSIC IOM REGATTA on Saturday, February 20th and it looks like there will be 20 boats on the starting line. Head Pirate, Capt Jack, advises that he will have to fleets, a gold fleet for more experienced skippers and a silver fleet for those with less experience. The silver fleet should have some tight racing, as a few of us hackers from the Victoria Fleet will be battling it out with our IOMs. This past week I found the leak that has been haunting me since the 1st time she hit the water. It seems the mast tube was leaking like a sieve! I went to Hew's shop and we put some thickened epoxy in the mast tube and sealed up the leak. 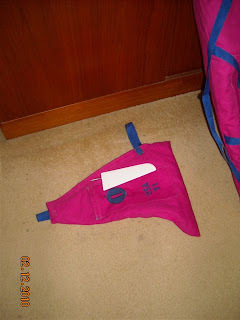 We (Hew) also looked at my 'A' mainsail and decided it would look better if it was trimmed a bit. We took the sail off the rig and then pulled off the luff tape and re-cut the luff and then reinstalled the sail. It definitely looks much better now. I will post more during or after the weekend. Notice the detail - embroidered number and 'fuzzy' material of inside lining of bag. 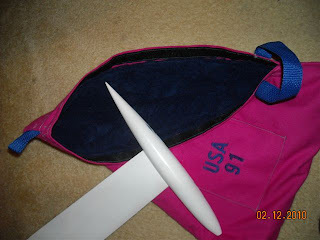 A pocket is sewn into the cover to hold the rudder, the nylon webbing straps are in the right location to be balanced when carrying the keel bag. 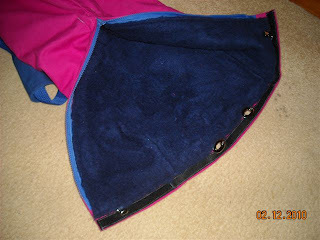 The inside of the boat bag is some type of fuzzy cloth to protect the hull. 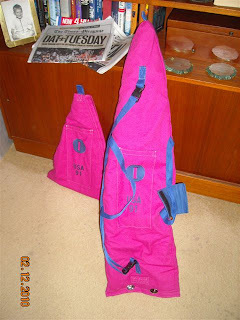 Notice the detail - my sail number embroidered in the cover and the handy carry straps. 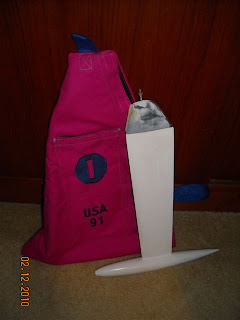 Here are both the hull bag and the keel bag.